Rosearik Rikki Simons is a voice actor, writer, and artist. He is most famous for being the voice of the robot in a dog suit, GIR from Invader ZIM. As a writer he is known for the science fiction and fantasy novel Hitherto a Lion. Original illustrated books and comics that he created with Tavisha-Wolfgarth-Simons include Super Information Hijinks: Reality Check!, Ranklechick and His Three Legged Cat, ShutterBox. He is currently working on The Trinkkits of the Sad Circus by the Sea and Rhumbaghost. He is also a background painter in animation, most noted for his color design on Invader ZIM. The comics and books he creates with Tavisha can be read and purchased at Rikkitikki Tavicat (tavicat.com). 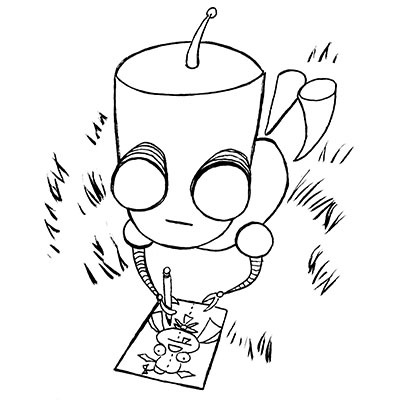 GIR, voiced by Rikki, created by Jhonen Vasquez, © Nickelodeon. Maks Pepon © Rikki Simons.